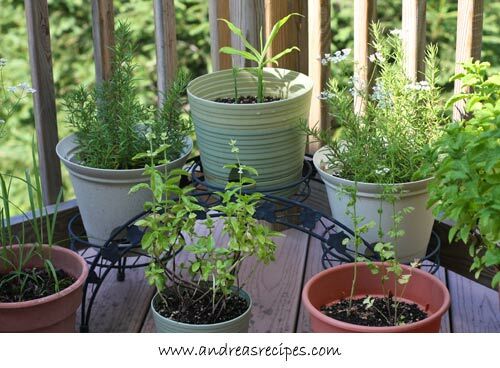 Long before I had Michael and the boys and a house with a yard, I had a few pots of herbs and tomatoes on the balcony of my small Chicago apartment. It was a small container garden, just enough for me and my roommate, and it was perfect for my needs at the time. To this day I continue to keep some things in containers even though we now have a few raised beds in our yard. My container garden varies from season to season and year to year. In the winter we grow basil and cilantro indoors so I have a steady supply of those herbs for much of the year. I keep scallions in a pot year round, indoors in cold weather and outdoors for the rest. 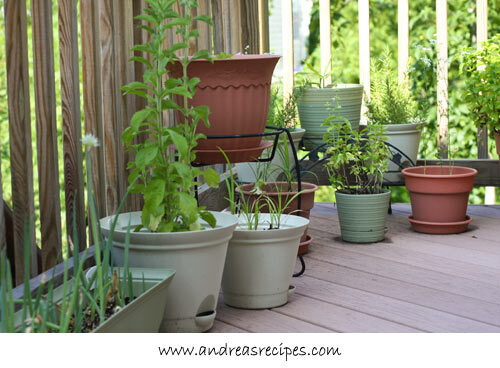 In the late spring we move the indoor pots out to the deck and plant new things in the remaining pots. This year our container garden has ginger, mint (transplanted from the yard), alpine strawberries, basil, rosemary, cilantro, lemongrass, stevia, eggplant, scallions, lavender, and sunflowers. We originally seeded the sunflowers directly in the ground, but the bunnies ate the first round of sprouts right down to the dirt, so we decided to start the sunflowers in pots then transplant when they get big enough to withstand the bunny assault. We had similar problems with the eggplants being tormented by eggplant flea beetles, so we decided to give it one more try in containers up on the deck and away from the ground to see if it would work, and it did. No more flea beetles and we have some beautiful little eggplants sprouting. This baby eggplant is a variety called Ophelia, a miniature eggplant with fruit that only weighs 2 ounces (57 g) when mature. 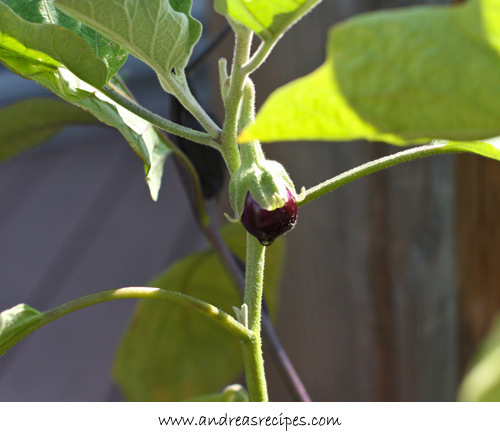 The plant is bushy but not very tall, just right for containers, and the little oval eggplants make perfect individual servings. The lavender was in the yard last year and had to be moved when we expanded the tomato and pepper area, so they are in containers for now. 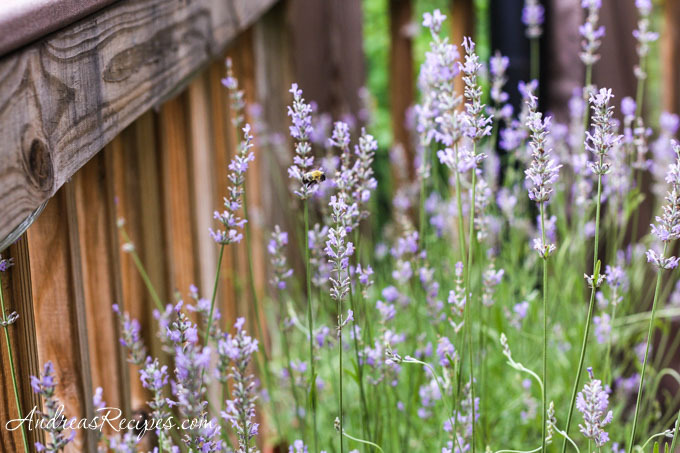 I plan to move them to another spot in the yard sometime this summer, but I might miss watching the hummingbirds and bees playing among the blooms on the deck. The ginger is my latest experiment. My friend Cris at From Our (Brazilian) Home to Yours said I could grow my own ginger, and of course I had to try it. I found a very fresh root at my local Asian grocery store with small green shoots on it, which I divided and planted in a pot. 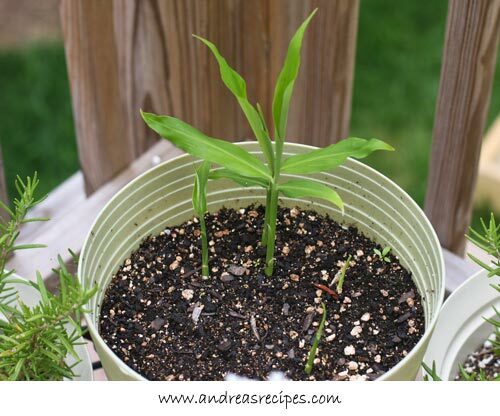 Ginger needs very warm weather to prosper, so I did this after the last frost and set it out on the deck. It seems to be doing well and I look forward to harvesting the root in a few months. After the total loss of all of the snow and sugar snap pea plants due to bunnies and chipmunks, I think next year we will plant those in pots on the deck too. Would you elaborate a bit on the amount if sunlight required for best results in growing common herbs. Hi Peggy. Most common herbs prefer full sunlight, but mint can even do well in partial shade. Ginger! Wow, I do hope I can remember that next year. I’d try it now but we’re having 100° days and night cool is in the low 80’s, difficult to start anything at this point. Have you tried lemon verbena? Hi Nate. I planted lemon verbena in the yard a few weeks ago, and so far it’s doing well. The scent is wonderful.